A pseudonym or alias is a name that a person or group assumes for a particular purpose, which can differ from their first or true name (orthonym). Symphonic black metal is a subgenre of black metal that emerged in the mid to late 1990s, and incorporates symphonic and orchestral elements. Mustis' surname Mustaparta comes from Finnish language. Literally translated, it means "black beard." Finnish is a Finnic language spoken by the majority of the population in Finland and by ethnic Finns outside Finland. Finnish is one of the two official languages of Finland ; Finnish is also an official minority language in Sweden. In Sweden, both Standard Finnish and Meänkieli, a Finnish dialect, are spoken. The Kven language, a dialect of Finnish, is spoken in Northern Norway by a minority group of Finnish descent. On 29 November 2010 Mustis posted the following statement on his Facebook fan page. "As you all can see I have no control over this site yet, but will try to get it soon as possible. If not..keep your eyes open for a new one. And thanks everyone for all the nice words in here. As you can see I decided to join my friends of Susperia where my first performance will be early next year. More info to come. In the... meantime you can always use google translate. -Mustis"
Dimmu Borgir is a Norwegian symphonic black metal band from Oslo, Norway, formed in 1993. The name is derived from Dimmuborgir, a volcanic formation in Iceland, the name of which means "dark cities" or "dark castles/fortresses" in Icelandic, Faroese and Old Norse. The band has been through numerous lineup changes over the years; vocalist Shagrath and rhythm guitarist Silenoz are the only original members who still remain, with lead guitarist Galder being a longstanding member. 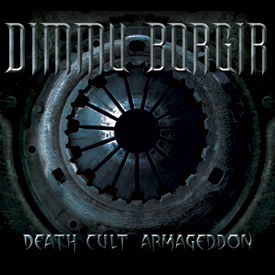 Death Cult Armageddon is the sixth studio album by Norwegian symphonic black metal band Dimmu Borgir, released on 9 September 2003. It has since sold over 100,000 copies in the United States; the first album under Nuclear Blast to do so; and debuted on the Billboard 200 chart at number 169. The song "Progenies of the Great Apocalypse" is released as single with accompanying music video. Parts of the album were recorded with the Prague Philharmonic Orchestra. This would also be the last album to have Nicholas Barker on drums. It also features guest vocals by Abbath Doom Occulta. Susperia is a Norwegian black/thrash metal band formed in October 1998 by Tjodalv and Cyrus. Stian Tomt Thoresen, known professionally as Shagrath, is a Norwegian musician best known as the vocalist, founding member and multi-instrumentalist of the band Dimmu Borgir. Stormblåst is the second studio album by Norwegian black metal band Dimmu Borgir. It was released on 25 January 1996 through Cacophonous Records, and re-released in 2001 by Century Media. The album is entirely in the band's native language of Norwegian, and was their last album to be completely in Norwegian instead of English. This is also the first album where Tjodalv switched to drums as opposed to guitar, the first where Shagrath is on vocals and the last where lyrics would be written by Aldrahn until 2003's Death Cult Armageddon, and the last album to feature Brynjard Tristan on bass guitar. Alf Peter Tägtgren is a Swedish musician, multi-instrumentalist and producer. He is the founder, main songwriter, lead vocalist, and guitarist of the death metal band Hypocrisy as well as the industrial metal band PAIN in which he is the only member. He is also the owner of The Abyss recording studio. Spiritual Black Dimensions is the fourth studio album by Norwegian black metal band Dimmu Borgir. It was released in 1999 by Nuclear Blast Records. A deluxe edition was released in 2004 with bonus material. There is also a digipak edition of this album which contains no bonus tracks. The digipak has reflective/holographic cover art. This release featured keyboardist Mustis and the clean vocals of ICS Vortex, as well as the departure of long-time drummer Tjodalv, guitarist Astennu, and bassist Nagash. Puritanical Euphoric Misanthropia is the fifth studio album by Norwegian black metal band Dimmu Borgir. It was released by Nuclear Blast Records in 2001. This is the first album to feature drummer Nicholas Barker, guitarist Galder, and ICS Vortex on bass. It is also the first album upon which the band used real orchestral instrumentation instead of keyboard lines. Simen Hestnæs, better known by his stage name I.C.S. Vortex or simply Vortex, is a Norwegian musician. He is the vocalist of the similarly named band ICS Vortex, the avant-garde metal band Arcturus, and the doom metal band Lamented Souls. He is also the vocalist and bass guitarist to the progressive black metal band Borknagar, and the former bass guitarist and backing vocalist for the Norwegian symphonic black metal band Dimmu Borgir. Tjodalv is a Norwegian drummer. He is a founding member of both Dimmu Borgir and Old Man's Child. He now plays in Black Comedy and Susperia. Tjodalv played guitar on the first Dimmu Borgir albums Inn I Evighetens Mørke and For All Tid. He then switched to drumming for them on Stormblåst and continued with this until 1999. Due to his family and musical differences he left Dimmu Borgir on amicable terms. He was replaced by Nicholas Barker, former drummer of Cradle of Filth. Illusions of Evil is a demo album by the Norwegian black metal band Susperia. This is the only album on which Susperia uses synthesizers played by Dimmu Borgir's keyboard player Mustis. 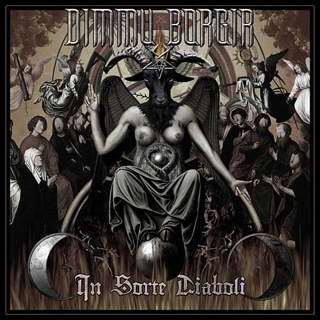 In Sorte Diaboli is the eighth studio album by Norwegian symphonic black metal band Dimmu Borgir, released in 2007. It is the band's first concept album. A site on the Nuclear Blast website was created for In Sorte Diaboli, in which a new promotional photo can be seen and an audio sample can be heard. This would be the last album by Dimmu Borgir to feature ICS Vortex, Hellhammer and Mustis. Lord Kaos was an Australian black metal band that formed in Sydney in 1994. For several years the group was the most prominent act of its style in the country with one founding member going on to record and perform with several Norwegian black metal bands including Dimmu Borgir. While Lord Kaos only released one album, the group was a considerable influence on the local heavy metal music scene as not only arguably the first but one of the few bands to record and perform Norwegian-style symphonic black metal. Astennu is the professional name of Australian heavy metal musician Jamie Stinson. His name is derived from a creature in Egyptian mythology. Witold "Vitek" Kiełtyka was a Polish musician, best known as the drummer and percussionist for the technical death metal band Decapitated, and younger brother of the musician Wacław "Vogg" Kiełtyka. He had been with the band since its inception in 1996, when he was only twelve years old. He also worked with the death metal bands Dies Irae and Panzer X. The Invaluable Darkness is a live DVD by symphonic black metal band Dimmu Borgir. It was released on October 14, 2008. The title comes from the closing track of In Sorte Diaboli, their eighth and most recent studio album at the time, despite the fact that the track does not appear on this release. Abrahadabra is the ninth studio album by Norwegian black metal band Dimmu Borgir, released in 2010. The first single from the album, "Gateways", was released on August 20 in Europe and August 24 in North America. On September 14, a video for "Gateways" was released featuring Djerv front-woman, Agnete Kjølsrud. On September 17, the song "Born Treacherous" was released on Dimmu Borgir's official Myspace for streaming. On September 24, the band announced they would stream Abrahadabra in its entirety, until 7 p.m. EST that evening. This would mark the first official release of all the tracks on the album. The album features drummer Daray and additional keyboards by Gerlioz. Cyrus is a Norwegian musician best known as the guitarist of Norwegian black metal band Susperia. He plays guitar and bass guitar. Gromth is a Norwegian symphonic metal band formed in 2008 in Ski, Akershus. ↑ "Former DIMMU BORGIR Keyboardist Claims He Was Fired Via Text Message". Blabbermouth. August 30, 2009. Archived from the original on September 3, 2009. Retrieved 2009-09-01. This article on a keyboardist is a stub. You can help Wikipedia by expanding it. This article on a heavy metal musician or group is a stub. You can help Wikipedia by expanding it. This article about a Norwegian musician is a stub. You can help Wikipedia by expanding it.